Sam grew up in and around Bristol where his father was also a parish priest. He met his wife, Paula, in Bristol while working in life assurance. 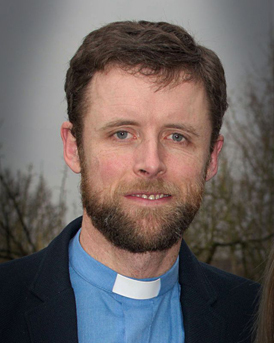 Sam's ordained ministry has taken him to Lostwithiel in Cornwall and Winnersh in Berkshire, and he has been Vicar of St Cuthbert Wells and Wookey Hole since May 2017. Sam enjoys exploring Somerset with his family, cycling, reading and photography. 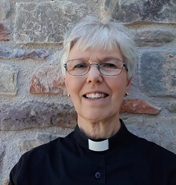 Clare was ordained in Wells Cathedral in 2013, having previously enjoyed 34 years working as an Occupational Therapist in Gloucestershire, Wiltshire and London. She served her curacy at St Thomas, Wells. 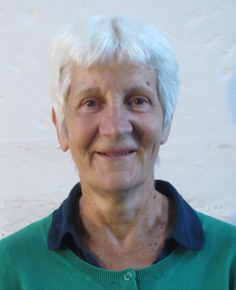 Clare loves spending time outdoors – gardening, walking and birdwatching. She and her husband, Nigel, are in the process of walking the length of the Thames Path from the source to the Thames Barrier in manageable stages! Alistair Glanvile is a retired farmer and lives at Westbury sub Mendip. He was licensed as a Reader in 1969 and joined St Cuthbert's in 2003. I have been attending St Cuthbert’s since we moved to Wells in 2001. Since retiring from primary headship in 2014 I have been the victim of others' powers of persuasion and my own inability to step back in time! This culminated in becoming a church warden in 2016. I still manage to find time for some of the things I had imagined would fill my retirement: a horticulture course; gardening; singing in various choirs; and long-distance solo walking. My husband, Dominic, still works with his own firm of organ-builders and seems to have no intention of retiring. We have two daughters and two grandchildren in various parts of the country and see them as much as we can.